I adore Ireland; it’s in my heart, and my soul is just another tree, blade of grass, or one of the whispers of an Irish breeze. I long for that land’s misty climes, its green rolling landscapes and all its taunting and unseen inhabitants. I feel at home there and one day will mostly likely live there, at least part time. I loved Ireland even before I visited my first time, yet it wasn’t an easy relationship in the beginning, no sir-ree, not a bit! So when I read Tanis Helliwell’s new book, “Pilgrimage with the Leprechauns,” I laughed and cried and felt nothing but empathy for each of her true-life characters. Imagine traveling to Ireland for the first time with great expectations that the country was filled only with love and a thousand welcomes. Isn’t that what slainte means? Imagine believing you would miraculously find yourself in some castle ruin and that this little stormy island would open it’s arms to embrace and carry you, like a long lost child of nature, beyond the veils of the otherworld, to a place of incredible beauty. Imagine expecting to find immediate work, to meet wonderful new friends and even a romantic soul mate. Ha! Instead, you meet a bi-polar escapee from a mental hospital in the North. Turns out you are a total fool, setting yourself up as bait, good pickins’ for the little people’s antics. During the first week your fantasy turns into the rainiest, grumpiest, most confrontational inner journey you’ve ever taken, and until this moment, you had no interest in learning about your shadow either! Spirituality was only a lofty and serene place high above the clouds, beyond the galaxy we know. The rental car company, without notice, deducts three times the price of the quoted rate from your teeny tiny available credit card balance; you have crazy dreams and feel lonelier than you’ve ever been; you are fearful and lost, blaming the locals for giving bad directions and generally resenting their bright-eyed snickers as you drive away in some unknown direction. There are parking tickets, stolen hubcaps, and fights with the authorities about all of it. You are in a constant state of complaint as there is no internet connection; the truth is, you plain and simply just wanted to experience something fantastical, staying home and reading about someone else’s travels. With what little money remains on your already bulging plastic ticket to a faeryland adventure, you eat potatoes, cabbage and carrots for five weeks straight, wandering around like a victim of the famine, at the effect of almost everything Irish. The brogue is so alien, it might as well have been Russian or Japanese. You look sheepishly and obviously, very American. Then one day the sun peeks out from behind the clouds and you finally find your inner Craic, your flow and your ability to meet the energies of this land which exist in a constant state of time warp and novelty. This is my story, and now, 15 years later, I’ve been to Ireland many times, expecting nothing and coming home with everything. You get the picture. My own story, like many others, is similar to the tale Tanis Helliwell tells in her recently released, “Pilgrimage with the Leprechauns.” Different people, same sites. Different experiences, same lessons. Eleven days on a bus with 30 people from varying levels of spiritual knowledge and even religious backgrounds; a matching number of journeyers who came specifically for the elemental experience, and those who doubted almost completely; at least 30 taunting elementals including goblins, trolls, brownies, faeries and leprechauns, all laughing while stirring the cauldron of inner growth; a stubborn bus driver who refuses access to the on-board toilet; a grumpy tour guide who is a self-touted expert and author writing about faeries yet doesn’t want to meet them, ever; and three different versions of a sacred site tour itinerary, planned 18 months in advance, all magnified by the tensions running between the three leaders who were attached to them! Yet, as dramatic as this seems, this is quite like a typical trip to Ireland, filled with trip-ups and misfires, when tourists meet up with the local Craic.The superficial definition of Craic is a joke, an adventure, or a good time, an identifier known as something quintessentially Irish. And while it’s all done in good fun, the Craic these tourists in “Pilgrimage with the Leprechauns” experienced together was much more than a visit to a local pub and a sharp poke in the ribs. At the very least, the Craic challenged everyone’s attachments and expectations. Some had physical manifestations, others more emotional and psychological experiences as a result of their own tightly held patterns and states of mind. The elementals were there “to help” each one of the participants get over themselves! In the end of course, some did and some didn’t learn to laugh at the inevitable reflections. In “Pilgrimage with the Leprechauns,” Tanis Helliwell describes the Craic as akin to the Tao, or The Way. The Tao is a life path; it is the meridians and other energy channels inside us that also weave through the planet and all its creations. Because it is nature, the Craic, like the Tao, offers a constant growth stimulus demanding surrender or else! Naturally occurring, there is darkness and light, balance and chaos living within each human and every little blade of green Irish grass. It’s all about the little streams and gentle currents, yet it is also the rushing rivers of change within every living being; that which we see and that we don’t see quite so easily. Unless we drop our roles, surrendering to the ebb and flows of something much grander than we are, we get caught up in the whirlpools, knocking about underneath the surface and only coming up for air when the water spins around a rock or bubbles up, just because. We are choking, bruised and battered by our own resistance to this thing we see outside ourselves called nature. In a time when the news is all pretty discouraging at best, “Pilgrimage with the Leprechauns” inspires us to be trusting and accepting without blinders. It’s an adventure story, a story of humans co-habitating with elementals; it’s about life lessons. It is told with humility and grace, a nod and a twinkle, and absolutely filled with Craic. Entertaining, insightful and provocative, I read it in an evening lying on the couch and am now working on my psychic transport skills. I’d like to smell the peat fires burning, to feel the wind and soak up the dew on my skin. I’d like to walk on that dark rich soil of Ireland again soon. 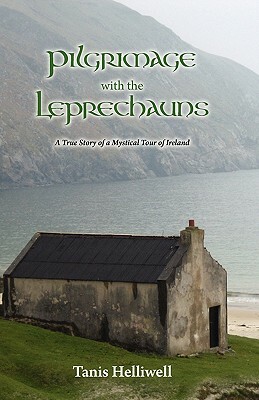 “Pilgrimage with the Leprechauns” is available at Tanis Helliwell’s website or at Amazon.com.